Barbados Supervisor Of Insurance Announces $2,500 Voluntary Fine For Infractions… That Should Stop Multi-Million Dollar Insurance Frauds Like CLICO! The recent collapse of the CLICO insurance company exposed the fact that successive Barbados governments have allowed insurance companies and offshore corporations to pretty much do as they please so long as those political campaign donations, kickbacks and business jet rides keep rolling in. But now that the world’s attention has come to focus upon our failings, Barbados decided to make some noises so investors and other governments will believe we’ve taken effective measures to supervise our offshore insurance industry. The key here is that we haven’t taken any new steps… we just make noises and promises so others will be taken in and believe that things have changed in Barbados. To kick things off, our Supervisor of Insurance held a press conference (Nation News article) announcing that the General Insurance Association of Barbados (GIAB) members have agreed to some voluntary standards that may be enforced by a $2,500 fine. It is hoped that maybe, sometime in the future, these voluntary standards might possibly become law in Barbados. Maybe. If. Sometime. CLICO investors and policy holders probably thought we had such standards as laws – but they thought wrong. But hey, we’re going to put those laws in place. Someday, maybe, if… but for now the Barbados insurance companies promise to volunteer to maintain those standards or risk having to pay (again voluntarily) a whopping BDS$2,500 (US$1,250) fine. Wow! That should prevent another CLICO-type collapse, don’t you think? Our lack of rules, laws or effective oversight is what allowed a healthy insurance company like CLICO Barbados to “invest” in huge loans to parent company CL Financial and other Clico companies – loans that were secured by way-overvalued swampland in Florida. Loans secured by deals where executives of CLICO-associated companies took secret commissions and kickbacks for engineering the over-payment for swampland! One of many: A US$3 Million Florida mansion belonging to CL Financial Director - Thanks for the bailout, Prime Minister Thompson! Meanwhile, the Directors of CL Financial were purchasing millions of dollars of prime, upscale Florida waterfront mansions for their own enjoyment and profit. That is the legacy of two successive Barbados governments and our Supervisor of Insurance, Carlos Belgrave. Now Belgrave says he wants to make a law requiring minimum capital standards for insurance companies. Hopefully Belgrave no longer accepts “bearer peat certificates” as security for capital! Such standards saw Belgrave named in 2006 as the “worst regulator” by Offshore Alert. In the case of CLICO, the Barbados insurance company was allowed to operate for years without sufficient cash reserves – and no one thought it dangerous when a otherwise healthy CLICO loaned all kinds of money to its parent company to purchase swampland in Florida at a price that greatly exceeded the real value of the land! Not to be outdone by the previous BLP Government for looking after friends and concealing the truth from the public, current Prime Minister David Thompson has pledged millions of your tax dollars to assist collapsed CLICO. Oh… did you know that the Prime Minister and CLICO CEO Leroy Parris are godfathers to each other’s child? Did you know that CLICO contributed to the DLP election campaign and that David Thompson borrowed CLICO’s business jet? All a coincidence I’m sure as the Prime Minister works diligently to socialize Clico’s losses with our tax dollars. You know the drill for the Prime Minister’s friends: Profits are private, but losses are paid for with your public tax dollars! 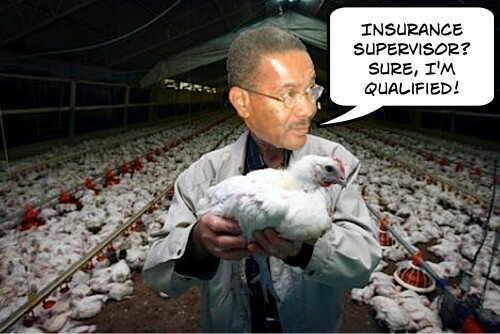 Barbados Supervisor Of Insurance Carlos Belgrave Approved US$ Half A Billion Insurance Assets That Were “Bearer Peat Certificates” !